Dissolve yeast and sugar in the warm water and let sit for approx. 15 min. or until foamy. 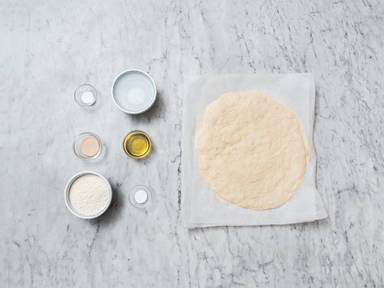 Combine water yeast mixture with flour, salt, and olive oil and knead using a hand mixer with dough hooks until a soft, smooth dough forms. Depending on the season and humidity you may need to add a little more water or a little more flour to make it into a workable dough. Cover with plastic wrap, and let rise until it's doubled in size, approx. 1.5 hrs. Punch down the dough and divide in half. Shape the pizza as you like on a floured work surface. Transfer to baking sheet or pizza stone and cover and let rise for approx. 90 min. more if at room temperature. Top pizza to your liking, bake, and enjoy!